Mercury enters its (approximate) 3 week retrograde cycle about 3 times a year (this phase began on the 4th and will end on the 28th). We all know that wars do not begin 3 times a year. The planet Mars, like the god it was named for, is considered to be the astrological significator of war. 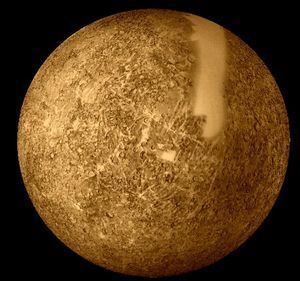 Not Mercury. It does signify communication, and when communication breaks down, war can be an inevitable consequence . . . but communication “broke down” long before this current retrograde cycle. Venus is generally considered to be the planet that rules diplomacy and other kinds of consensual human relationships (love = getting along, working it out, and yes, compromise) and it is not retrograde. To explain his reasoning for mentioning his interest in Mercury Retrograde, within the context of a post which was really about extremist thinking, Drobney goes into a personal story in which he describes how he was “sold” on the relevance of Mercury retrograde when a wholistic healer “an expert in energy medicine” explained that his treatments were not having the wished for effect because they were being applied while Mercury was retrograde. Drobney then explains that he felt much better a few weeks later “after Mercury turned direct.” Well, that may be, but studies have shown that most minor illness will take care of themselves if given time, rest, and good nutrition. So who knows? Before anyone thinks that I have gone mad, let me explain what I think about the unexplainable. I am agnostic as to the existence of traditional religious beliefs about god as described in Judeo-Christian scriptures. It is my belief that the god of Abraham is used as a rationalization of an unexplained powerlessness that those who wrote the scriptures were inclined to believe in as an explanation of unforseen human events. Death, earthquakes, plagues, and other unforeseen events were all explained in terms of forces of good and evil. But, I believe that modern science has shown us that the forces of nature are indifferent to human affairs. And that we may actually be connected to the cosmos in ways that have nothing to do with our current beliefs in good and evil. One can say the same thing about astrology — that it is also used by many as “a rationalization of an unexplained powerlessness” . . . [and] “explanation of unforseen human events.” Not that I have any problem with the use of symbol, myth, and religion to make peace with the inexplicable. As long as it doesn’t harden into dogma. The point being is that dogmatic types will express their belief system in a dogmatic way, regardless of whether that belief system is a religion or science or astrology. Great website. Are you playing with my long hour Wanna joke?) When should you use milk to irrigate your fields? When you are growing creamed corn. Refreshing article. Yes I am tired of hearing from people with a superficial understanding of astrology. (And from “New Agey” astrologers who think their [sometimes, quite shallow] beliefs are facts.) There are some quite good astrologers though who write intelligent books and articles based on a more rigorously analyzed empirical basis and do not keep the subject in the gutter. The rest may as well set up their booths at the mall and sell crystals and magic trick card games.